Obituary for Margaret M. (DeRemer) Guinter Paulhamus | Knight-Confer Funeral Home, Inc.
Margaret M. Guinter Paulhamus, 88, of Williamsport, passed away Sunday, Aug. 19, 2018, at UPMC Susquehanna Williamsport. Born July 5, 1930, in Williamsport, she was a daughter of the late Oran C. and Mamie (Bolich) DeRemer. Margaret was a 1948 graduate of Williamsport High School and attended Williamsport School of Commerce. She was formerly employed with Porter Township and Mifflin Township as a secretary for many years. 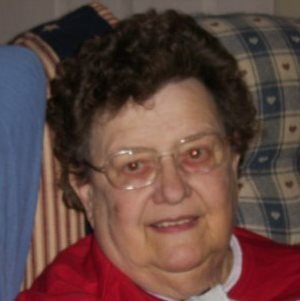 She was a member of Larryville United Methodist Church and Lycova Grange. She enjoyed bowling and was a member of the Harvest Moon Bowling League. She also enjoyed crocheting and in her younger years, playing the accordion. Surviving are her children, Sharon A. Knarr (Gilbert), of Anacoco, La., Laura J. Ortega, of West Valley, N.Y., Mary L. Guinter, of South Williamsport, Harold E. Guinter Jr. (Mary Shaffer) and Oran W. Guinter (Marianne), both of Jersey Shore; eight grandchildren, Gilbert Wayne Knarr, Victoria G. Nagayama (Cliff), Antonio G. Ortega, Michelle V. Ortega, Harold E. III, Steven R., Braden H. and Ian H. Guinter; a brother, Oran Earl DeRemer (Naomi), of Fairfield, Calif.; and a sister, Esther Tudor, of Williamsport. In addition to her parents, she was preceded in death by her first husband, Harold E. Guinter Sr. and her second husband, Charles F. Paulhamus; three brothers, Edgar, Charles, and John DeRemer; and three sisters, Elizabeth LeVan, Helen Patton, and Emily Senseman. A funeral service to honor the life of Margaret will be held 10 a.m. Friday, Aug. 24 at Larryville United Methodist Church, Larryville Road, Larryville with the Rev. Kevin E. Brophy officiating. Burial will follow in Twin Hills Memorial Park, Muncy. The family will receive friends from 6-8 p.m. Thursday at Knight-Confer Funeral Home, 1914 Memorial Ave., Williamsport. In lieu of flowers, memorial contributions may be made in Margaret’s name to Larryville United Methodist Church, 366 Main St., Salladasburg, PA 17740 or the Presbyterian Home at Williamsport, 810 Louisa St., Williamsport, PA 17701.